The formal note says the U.S. government has threatened Venezuela with a military operation and imposed unilateral coercive measures against the nation. July 6 (teleSUR) Venezuela has delivered a letter of protest to Ecuador’s Chargé d’Affaires Elizabeth Mendez, accusing Ecuador’s President Lenin Moreno of interfering in the nation’s internal affairs. Venezuelan Deputy Foreign Minister for Latin America Alexander Yanez said the note states that Moreno offered statements and interviews to U.S. Vice-President Mike Pence concerning Venezuela. 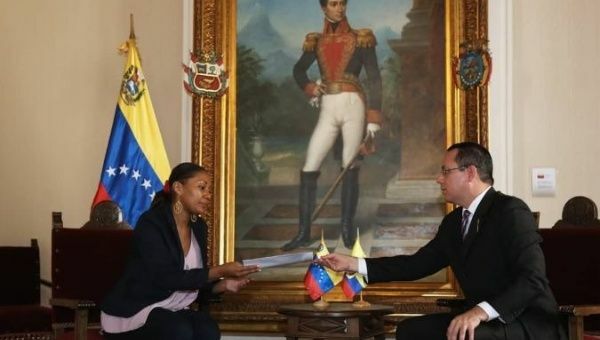 “It is important to note that the representative of the U.S. government has threatened Venezuela with a military operation and has imposed unilateral coercive measures against the Venezuelan economy and people,” Yanez told Mendez after the letter was delivered on July 4. The note also points out that the Venezuelan government never questioned the legitimacy of Ecuador’s last presidential elections, and calls on foreign governments to respect the democratic re-election of Venezuela’s President Nicolas Maduro in June. Yanez said Ecuador’s former President Rafael Correa is considered a friend of Venezuela, where he is respected for his ethical, political and humanistic qualities. As such, he continued, the Venezuelan government has a duty to express solidarity with Correa and his family, at a time when he is apparently being persecuted by his political rivals. Correa was the subject of a court ruling earlier this week calling for him to be placed in preventive detention in connection with the failed kidnapping of an opposition lawmaker in 2012, a charge Correa denies.